A second larger and longer surface dog leg drift 1964-1966 was completed at Kirkby (Nottinghamshire) down to the Threequarter seam. A new Safety in Mines Research Establishment was opened at Buxton, (Derbyshire) by Fred Lee MP Minister of Power (Lab) 1964-1966. Numerous experiments would be carried including explosions in a purpose made gallery. Methane drainage boring up and over the waste was started at Ollerton (Nottinghamshire), one of first in the Area, where previously gas migration via pipes from the waste was practised. The gas was pumped and then released at max 2% into the general body at a convenient safe point. Duckmanton (gate end boxes, control units, electric and hydraulic drills, powered roof supports). Cables were repaired at Blackwell. Repairs for South Derbyshire and Leicestershire were at Bretby. Clipstone to Rufford demarcation line in the Top Hard seam was created on 7th May, and the Clipstone to Warsop demarcation line on 10th May 1965 (Nottinghamshire). The M1 motorway was built through the Pinxton area in 1965 and the old Green shaft was filled in. 5 other old shafts were similarly dealt with as the motorway was built directly over them. Pillars were left in the Waterloo seam at Bentinck (South Nottinghamshire Area) to protect the motorway and in the North Derbyshire Area one panel in the shallow Clowne seam at High Moor was worked directly under and along the line of the motorway to minimise damage. Other older Deep Soft workings under the M1 site were from Old Strelley in 1860 and Cossall 1959. An old shaft under, E450 010, N341 450 app sunk to either Deep Soft or Deep Hard, no details known. A pillar was left for Strelley Hall and Church in Deep Soft and Deep Hard (1953) but not in Piper seam worked 1955-1956. In Derbyshire the M1 motorway ran very close to the Markham complex (No1 and No4 pits). (A new complex of industrial buildings was built on the site after Markham had closed in 1993 and a new Motorway access No29A was constructed later). Freight traffic including coal was finished on the Great Central railway line through Mansfield, Sutton and Kirkby with the closure of the line and there was a rundown of work for Annesley marshalling yards, most of the work being coal traffic from local pits to send to the South of the country. During the year the Government’s National Plan and the White Paper ‘Fuel Policy’ were published estimating that the proposed output previously calculated could not now be achieved. There was a lack of confidence in the industry and many men left the industry, creating a shortage of manpower, particularly in the central coalfields, including Derbyshire and Nottinghamshire and Leicestershire. Daywage men had their wages increased by between 11s 6d (57½p) and 17s 6d (87½p) a week. Some protective clothing was issued free to new entrants to the industry and to men working in certain conditions. A new Mining Apprenticeship Scheme covering 3½ years was introduced in July, where the juniors were assigned to various jobs in rotation over that period, thereby giving them an overall view and wide experience in the industry. Almost all were attached to the Survey department for a period. In 1965, Cotgrave (Nottinghamshire) produced only 276,397 tons from the Deep Hard seam with 850 men. 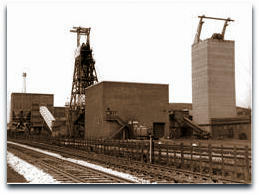 Clipstone (Nottinghamshire) produced its highest ever tonnage of 1,310,034 tons with 1,607 men and an OMS of 75.1cwts. At Newstead (Nottinghamshire) a 6 ton capacity skip fell down Newstead Shaft (457m). The winding rope had snapped because it had come off the winding drum. It was found that the wrong type of oil had been used. The main damage done fortunately was a mass tangle of ropes and cables. 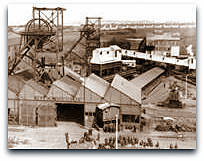 Bevercotes colliery (Nottinghamshire) re-started production from the Parkgate seam. It was hailed as the world’s first push-button pit and was planned to last 100 years. New technology such as automation was installed instead of the coal being worked by conventional means. 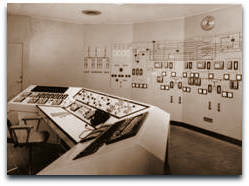 The underground control centre is shown. Many men were attracted to the new mine from Scotland and the North East particularly where mines were closing every week. A series of surface boreholes were drilled to the Clowne seam for a proposed Drift mine at Teversal (Nottinghamshire). However the seam was quite thin, being less than 3 feet (0.91m) thick and very close to the water-bearing strata. The seam was worked quite successfully at nearby Bramley Vale drift mine (Glapwell) in Derbyshire. The Mechanics and Electricians Regulations 1965 came into force during the year. It outlined the duties of the colliery engineering staff. The colliery Manager’s scheme for the mine was set up. Planned Preventative Maintenance (PPM) clerks were appointed and documentation of all equipment was kept, with chargemen filing in forms to state that certain equipment had been checked and then a reminder would be issued via the system when that equipment needed checking again. At Teversal, Ike Sutton, previously a Deputy at Silverhill who had had an accident, busting up his ankle whilst riding a conveyor belt with a hole in it, was appointed. Coal Industry Act 1965. Various additional rules etc would be brought in. Under the CIHA (Coal Industry Housing Association) semi-detached housing was built at Rainworth. Other estates were built as mining communities or as additions to existing miners’ housing. Redundancy Payments Act 1965 enacted to make it easier for workers to move to new jobs should the opportunity arise. Instituted compulsory payments to the individual concerned. Beat: The National Insurance (Industrial Injuries) Act 1965 recognised 2 types of subcutaneous cellulites and acute bursitis – beat hand. Tenosynovitis usually due to constant repetition of stereotyped movements involving grip between fingers and thumb accompanied by a quick pronation supination movement of the forearm – local aching, pain, tenderness, swelling and crepitus aggravated by movement or pressure. Ancient Bell pits in the Tupton seam were located and exposed at Heage in Derbyshire sometime previously and some at Saltergate measured from 16ft x 10ft (4.9m x 3m) to 19ft x 12ft (5.8m x 3.7m) and were about 20 feet (6m) deep. Nottingfield Farm Alton (soft smutty coal 4 feet (1.22m) thick), 23/1/1965. Annesley Loco depot (Nottinghamshire) was closed down in December 1965. Many engines were deployed from here particularly for coal traffic over the former Great Central and Great Northern lines in the area. Thoresby (Nottinghamshire) produced 1,488,807 tons for the year 1965 with 1,714 men. High Marnham 930Mw power station on the River Trent opened during the year with coal from local pits being used. Drakelow at Burton was a 910Mw station. A point of interest: All nationalised mining in the Forest of Dean ended leaving the few remaining Gavellers or Free miners with small adit workings to continue. A Free miner was one who had worked in a mine under supervision for one year and a day. He could then work his own mine. AW Davies promoted to District Inspector to replace RA Ridsdale vacancy. G Jenkins retired after 29 years. Replaced by M McCarthy. A Chaplin promoted to South Nottinghamshire and RA Bower replaced him. P Williams to Leicester / South Derbyshire. JS Marshall, M McCarthy, WF Gill, W Whitehouse, CH Hodkin, RF Young, AW Davies, S Marlow, RA Bower, D Richards, F Mackie, F Stephens, T Vaughan Thomas, H Jones., A McMurray, GDR Adamson, J Bennington, A Monks and P Williams. 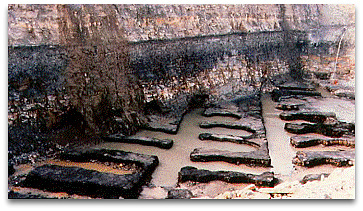 81 pits plus 4 in Yorkshire and 11 small licensed mines produced 45,039,594 tons plus 1,702,607 tons. 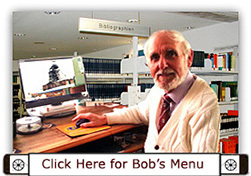 82,590 men on books, a decrease of 5,299. Mechanisation increased from 88.4% to 91.4% at 49.92 cwts oms. 26 men killed and 176 serious accidents. Bevercotes No2 tower mounted multi-rope friction winder with 12 ton skips. Coal prep plant with 600 tons per hour throughput. Shirebrook No2 pit bottom drivages. Surface fittings finished. Surface drifts at Ormonde and Bramley Vale completed. Surface drifts at Kirkby and Bentinck continued. Experiments with stable hole elimination. 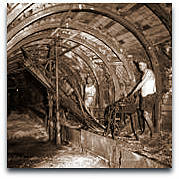 A large number of men still had to walk 4 or 5 miles underground to working face. There were 7 sudden emissions of firedamp from the floor and at one around 20 yards (18m) of floor heave in the Return gate. 666 horses in 51 NCB pits and one licensed mine and one Ironstone mine, but 15 horses died or had to be destroyed because of injuries. Self rescuer canisters issued in 1963/64 were withdrawn and replaced with more robust, longer life canisters. Eventually they would be issued to everyone going underground. At Rescue Stations there were 12 Officers, 39 permanent corps and 568 fully trained men at pits. There was only one rubber conveyor left working, all others being replaced by PVC type.